The SEAMEO* Regional Tropical Medicine and Public Health Project was established in 1967 to help improve the health and standard of living of the peoples of Southeast Asia by pooling manpower resources of the participating SEAMEO member countries in a cooperative endeavor to develop and upgrade the research and training capabilities of the existing facilities in these countries. By promoting effective regional cooperation among the participating national centers, it is hoped to minimize waste in duplication of programs and activities. In 1992 the Project was renamed the SEAMEO Regional Tropical Medicine and Public Health Network. 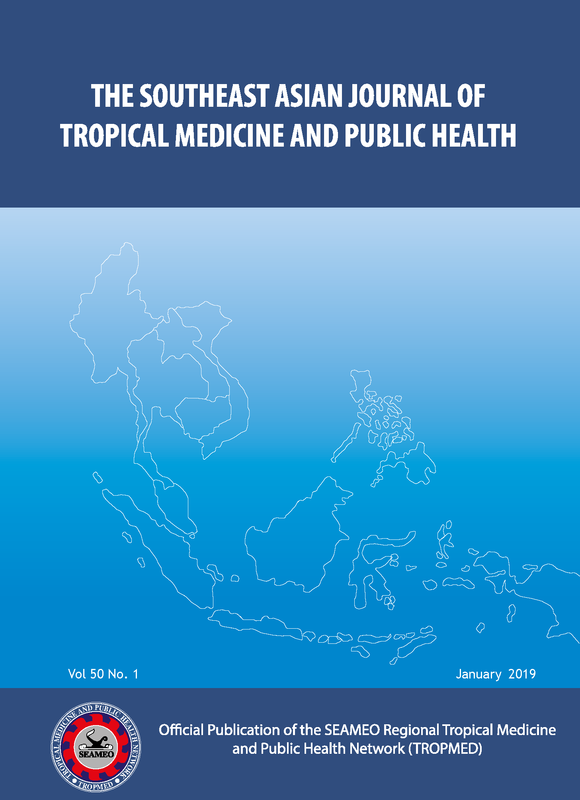 The Southeast Asian Journal of Tropical Medicine and Public Health is published by the SEAMEO Regional Tropical Medicine and Public Health Network (SEAMEO TROPMED Network). One annual volume comprises of six bi-monthly issues (January, March, May, July, September, and November). Annual subscription for 6 issues is USD 310.00 (including postage). Single copies USD 60.00. Subscription payment in US dollars must be made by credit card (VISA or MASTER). Use the order form on the last page of our journal and send to SEAMEO TROPMED Network, 420/6 Ratchawithi Road, Bangkok 10400, Thailand. The Southeast Asian Journal of Tropical Medicine and Public Health has been selected for coverage in Thomson Reuters information services, beginning with Vol 40 (1) 2009: Science Citation Index (SciSearch®), Journal Citation Reports/Science Edition, and Current Contents®/Clinical Medicine, in addition to the existing inclusion in Biological Abstracts, BIOSIS Previews, and Zoological Record.